The agency of chance is one of the most powerful tools any artist has at their disposal, and yet, perhaps due to its very unpredictability, it is rarely used in contemporary art. Blackpool-based artist Adrian Pritchard’s solo-exhibition Terraforma however, brilliantly exemplifies what is possible with this kind of approach. 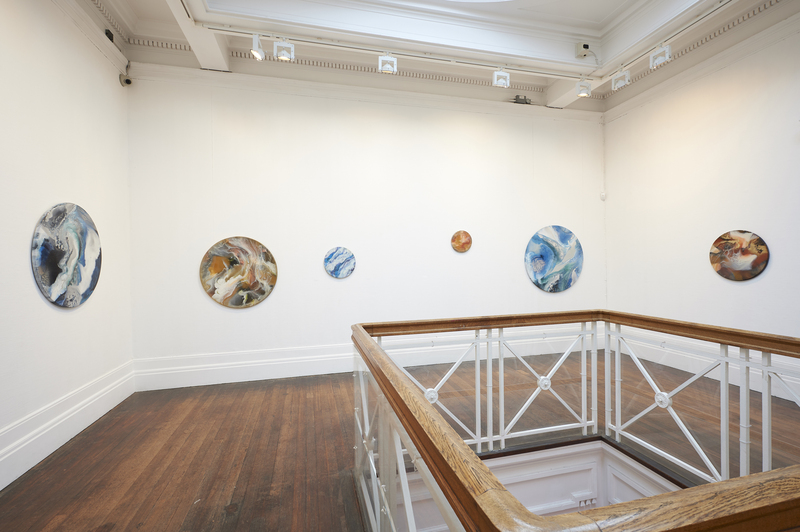 The show at Grundy Art Gallery comprises of a selection of Pritchard’s recent paintings, which are based on his ongoing astronomical research, many being named after extra-solar planets. The paintings are made using a combination of resin and metallic pigments which are poured directly onto circular discs. Layers are then added and the discs tipped and turned until the piece is complete, allowing gravity as much as the artist’s hand a role in giving form to these paintings. Though initially striking, the exhibition’s opening piece, ‘Red Kepler’, seems almost understated after gazing into the icy expanse of ‘Terra Aqua’ and the complex turmoil and excitement of ‘Terra Inferno’. When encountering these paintings (as is most often the case with good works of art), the longer you stare, the more is revealed. Indeed, there is a strong sense throughout the exhibition that the viewer is being encouraged to engage imaginatively with the work; to imagine the turbulent or the dead surfaces of other worlds and identify this with whatever meaning they may find in themselves. There is no overtly emphasized meaning here. The viewer isn’t encouraged to consider any particular point of view, and yet the paintings do seem, if mutely, to express some profound truth. The true strength of the work presented in Terraforma, lies in the artist’s evident faith in serendipity. Similar pieces could be attempted using carefully designed patterns, but the effect of simply pouring resin and pigment onto a circular disc could never be equalled by direct and deliberate design. The process works beautifully and indeed raises interesting questions about physics and chemistry. After all, the same forces which formed the elegant and apparently chaotic patterns of these paintings are at play in the surfaces of the very extra-solar planets by which they were inspired. Pritchard’s work also exemplifies the often-overlooked importance of encountering art “in the flesh” rather than viewing images online. One of the most intriguing parts of the experience is the visual relationship between the patterns in the resin, and the distorted forms of the gallery space and viewer whose reflections move across the glossy surfaces of these alien landscapes. It is also, of course, possible to see the paintings reflected in each other; an effect which may be totally incidental yet, once noticed, nonetheless serves to heighten the dialogue between them. Conceptually therefore, Terraforma could either be read in a very straightforward or highly complicated manner, depending on the viewer’s interpretation. It is precisely the lack of obvious or specific meaning which gives this work such broad scope, and perhaps something of a universal appeal. It is very difficult to say why these paintings are so absorbing, but then – ultimately – they speak for themselves. Adrian Pritchard is a visual artist and educationalist based in Blackpool. Terraforma, Grundy Art Gallery, Blackpool. 20 January – 14 April 2018.